I know this problem has already been discussed here, however I couldn't reach a clear conclusion from the various posts I've read so far. Do we have now a way to solve the common Kharaj & Pancham strings intonation problem on the surbahar (lower frets producing too high a pitch than their theoretical positions should)? I of course know what minds are for, however what to do when komal re on the kharaj string and komal dha on the pancham string are unplayable? Playing those strings behind the nut is clearly not convenient at all... Or is it common practice to tune those strings quite a bit lower in order to compensate the fret problem? But we would then lose their open string playing and contribution to the overall harmonic halo of the instrument. I wonder if all surbahars are affected by this intonation issue to the same extent, or do some makers have a trick to minimise or even solve it? My surbahar was made by Jayanta Sengupta and the problem is quite severe on it (though it is a beautifully sober and good sounding instrument). While thinking about the problem, I realised that my sarod (which has an 5th additional low pancham string) is also affected: since there's no fret it is not apparent immediately but on close inspection, it is clear that on low sa and low pa strings (the 5th one) the finger positions are not vertically aligned (like a virtual fret) at least up to ga or ma -and the sarod is a rather short instrument diapason-wise compared to the surbahar, yet the problem is (already) there. I know next to nothing about luthery technicalities, but there should be a good reason why the bridges on guitars are slanted. I wonder if this could not be adapted to our beloved Indian string musical instruments and solve the intonation problem? Thanks in anticipation for any help! So the issue here with surbahar/sitar, as you may know, is that the frets are curved, creating a farther distance to push down the kharaj, and to a lesser degree, pancham. This is in effect like pulling a little extra meend after fretting, which results in a higher-than-desired pitch. I imagine this was not an issue, or less of an issue, with the older instruments that had rail frets, as it seems like the distance for all strings to travel would be uniform. I have a sitar and surbahar from Mohan Lal Sharma. both can be a bit temperamental with these notes (komal Re + Dha), but generally speaking I have resolved it by fine-tuning the bridge position - essentially pushing it slightly back if I noticed that these notes were too high. Once I did that, I have had no issues. If it is a particularly temperamental day, I have no problem with moving the fret so that the lower notes are in tune, and maybe I have to give slight meend to tune komal Re and tivra Ma on the jori and baj. Still, that's really not a common predicament. There is also the possibility with many instruments that the slots on the targahan were not cut low enough. Altering this is of course risky, but if done carefully, can help the issue. I was actually recently told, and I hope that I am recalling this correctly, that it was/is common practice for knowledgeable builders to intentionally leave these slots shallow at first, because they know that in the first year or two the angle of the neck of the instrument will slightly shift as part of the breaking-in process. Once the instrument has broken in, the thing to do would be to bring it back to the maker to make some adjustments, including cutting these slots a bit deeper, bringing the strings to to correct height and making the notes more in tune. Therefore, it would be understood that in the beginning these notes are out of tune and there's not much to be done about it but do your riyaaz and be patient. On the other hand, both my instruments are fairly new (sitar 2 years, surbahar less than 1) and I was able to correct these notes with slight adjustment of the bridge, and had no adverse effect i.e. sound quality/fret buzz, etc, just needed slight jawari. Hope that all makes sense and is helpful. Would be interested to hear your feedback and experience if you have tried any of the above yourself. 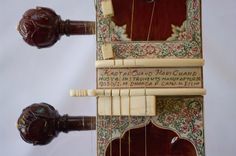 A "kharaj block" can be affixed under the nut at the bass satrings to slightly shorten the string length. This will result in needing to tune the open bass string(s) a titch lower resulting in proper intonation when pressed against the frets. The string length needs to be measured and the proper size of the block needs to be determined based on the amount of detuning required. I have one on my Barun#1 and it is most effective. Here is a pic of one. It is a bit wide but often they are made wide to allow more surface to adhere it to the neck, but the areas under the non-bass strings are low and not in contact. Thanks all for the various tips, here's a a little feedback after a few weeks of testing some solutions. Nut modification: I didn't try to file a deeper slot for the kharaj and pancham strings, as I'm not really confident in my skill for that. It's a non return operation and filing too deep, causing buzzing and having to completely remove the nut for a new one... Let's only risk that only when all else has failed! Altering the bridge position: I could have tried that, but eventually left the idea aside as it seemed only a trade between having the 2-3 first frets on the kharaj and pancham strings too high pitched, and having the same frets on the jhor and baj strings too low pitched (once the bridge position adjusted). Yes, then a little mind from too low to the correct pitch is possible, yet I wouldn't consider that a real solution. As I have a spare parda, I tied that extra fret at the correct position between the nut and the previous 1st fret: perfect pitch as one would expect, however at the cost of really having not much room left for the fingers... Actually, I have rather thin fingers so the room left could have been OK but I use 2 fingers to bend the strings, especially on the bass strings up the neck. So after some time I removed the extra fret and simply forced the 2 first frets to slant as much as possible towards the nut, resulting in a reduced intonation problem. It's still not perfect but much less "horrible", and at least the jhor and baj strings remained largely unmodified. I've been practising like that for some weeks now and I realise that it's still not a viable solution: the frets need constantly to be forced back to their slanted position, the ties are getting loose etc. (and when I look at those frets -I know it may be stupid- but it looks that the instrument is "suffering" from some ill treatment... I just don't like it). I guess then the "kharaj & pancham-block" or "bass-block" would be a much more elegant and perfect solution to that intonation problem. Tony Karasek (sitarfixer) has been mentioned, I'll try to contact him via his website but I wonder if a kind of "generic" bass-block would work as I'm located in Europe and won't send him my surbahar -maybe providing him with pictures and measurements would help. We'll see (I'll post another update with some pictures if all goes well). "Nut modification: I didn't try to file a deeper slot for the kharaj and pancham strings, as I'm not really confident in my skill for that. It's a non return operation and filing too deep, causing buzzing and having to completely remove the nut for a new one... Let's only risk that only when all else has failed!" use it like a file, don't push down hard. a file isn't the right tool - it'll widen the slot. make sure the nut's deep enough so that cutting the notch deeper won't cause a problem. assuming it is, go slow, keep checking the intonation to know when you get the right depth. On kharaj generally you can expect 1 or 2 whole notes in tune. Laraj you can get 5 or more. Most makers don't know or don't care about this, on a good jawari for a kharaj pancham setup half your time is spent on the kharaj since its so particular. The tuning should be dead on and no jumping on the bridge before starting, I lower the slots on all the instruments but a bass block can work if you prefer. Just make sure the string has a clean departure point rather than a 'jawari' surface which is useless at the nut. Thanks for the recent inputs. I believe I'll first try the bass-block. Lars, do you think a kind of generic bass-block is possible? If yes, I'll contact you via your website (I'm already one of your a customer by the way). Possibly, just email me with details and photos of the nut and the maker and we'll take it from there. I have a bass nut extender that I made in resin for sitar, could maybe be modified.